A worksite wellness survey conducted by Healthy IU found that 82 percent of IU employees across the state spend the majority of their days sitting at a computer. While some of us try to combat the sedentary nature of our work with standing desks, lunches and meetings, more rigorous physical activity throughout the day can be vital to sustaining both your physical and mental health. Healthy IU has designated four 2,000-step, one-mile walking loops on the IU Bloomington campus. The Arboretum Art Trail, the Shaded Wilderness Trail, the Red Brick Trail and the Woodlawn Loop Trail can help you reach your step goal and explore some of the most beautiful parts of campus. Check out the IU Bloomington walking trails map to try one or a few of these loops. The IUPUI walking trails are appropriate for all levels of walkers and are scattered throughout campus so anyone can enjoy a nearby trail, regardless of their office location. 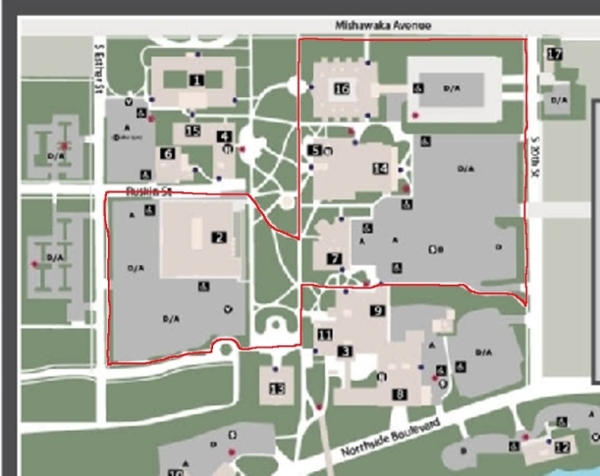 The Campus Loop is a 3.1-mile trail that outlines the perimeters of the IUPUI campus. Six smaller trails ranging in distance from 1.2 to 1.42 miles have been designated within the larger Campus Loop. The IUPUI trails provide walkers with a variety of sights to see including the Carroll Track and Soccer Stadium, Riley Hospital for Children and the north end of the Indiana Central Canal. While faculty and staff are more than welcome to walk the well-marked cross country track on campus, designated one-mile and half-mile walking paths provide an option with the smoother terrain of a sidewalk. Each path is marked with brick pavers, and maps of the IU East trails are available in the Center for Health Promotion. Did you know a trek around Kingston's Crossing is approximately one mile? Follow the red brick trail markers to get your steps in during the workday. Next time you need some fresh air or to be inspired by the outdoors, do a few laps around the Hawk Walk Loop. One lap is equivalent to 0.25 miles. The loop conveniently starts behind Hawthorn Hall and is designated with red brick trail markers. There are plenty of places to stretch your legs outdoors at IUPUC, but if the weather doesn't cooperate, you can take your trek inside to the Campus Center. Signage on the second-floor halls will let you know distances based on the number of laps you've walked. A one-mile trail through the IU South Bend campus is marked with permanent trail markers, but seven more trails on or near the campus have been measured by Healthy IU..
For when the weather is nasty, seven indoor trails have been measured for distance. Each is less than one mile. The Grenadier-Alumni Loop, stretching approximately 0.5 miles, and the 0.4-mile Orchard Loop have been designated by brick pavers on the IU Southeast Campus. Each loop begins and ends at the clock tower.